The Applaws Layers is tasty, layered food. The bottom layer consists of tender and lean chicken meat or fresh tuna. The top layer is a combination of lamb, anchovy or prawn in a creamy jelly. This Multipack combines all Layer flavours in one convenient multipack. 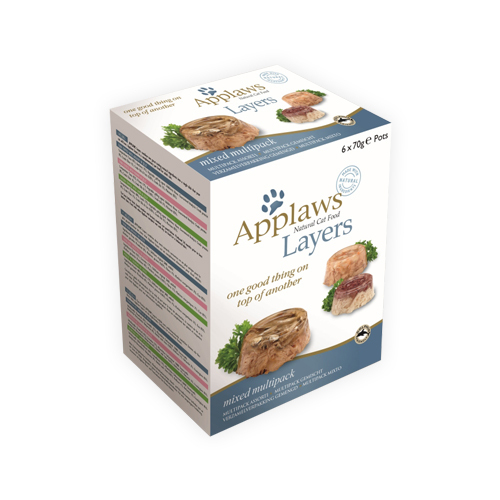 The Applaws Layers combine two natural ingredients in a tasty wet food. This protein-rich food consists of two layers: one layer of tender and lean chicken meat or fresh tuna and a topping of lamb, anchovy or prawn. This is enveloped in a jelly made from seaweed. This Applaws food is a natural source of taurine. This nutrient supports the condition of the eyes and is beneficial for the heart. Chicken & Lamb Layers: Chicken (40%), lamb (17%), vegetable gelling agent. Tuna & Anchovy Layers: Tuna (43%), anchovy (17%), vegetable gelling agent. Tuna & Prawn Layers: Tuna (43%), prawn (17%), vegetable gelling agent. Have you used Applaws Cat Food - Mixed Multipack Layers before? Let us know what you think about this product.